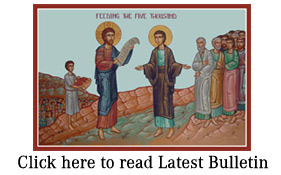 PDF of St Athanasius bulletin 4.5.14 SUNDAY OF THE OINTMENT-BEARERS has many interesting articles in addition to the liturgical schedule. MON. MAY. 5 The Holy and glorious Martyr Irene. Our Ven. Fr. Nicephor, Hegumen of the Medikion Monastery. TUE. MAY 6 The Holy and Just Job the Long-suffering. WED. MAY 7 The Appearance of the Sign of the Cross in the heavens at the third Hour of the day in Jerusalem, before the Emperor Constantius. The Holy Martyr Acacius. THU. MAY 8 The Holy Apostle & Evangelist John the Theologian. Our Ven. Fr. Arsenius the Great. FRI. MAY 9 The Holy Prophet Isaiah. The Holy Martyr Christopher. Translation of the Holy Relics of St. Nicholas to Bari, Italy. SAT. MAY 10 The Holy Apostle Simeon the Zealot. SUN. MAY 11 SUNDAY OF THE PARALYTIC MAN. [MOTHERS’ DAY]. The Foundation of the City of Constantinople. The Holy Priest-Martyr Mocius. Our Holy Fathers Cyril and Methodius, Apostles of the Slavs.